Student Sweaters in Progress Photos! 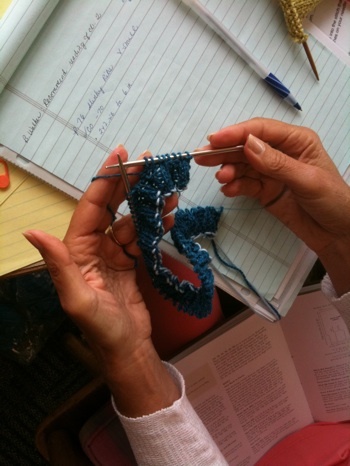 I’m thrilled – it is genuinely wonderful to see you all taking steps in your knitting – the comfort level you have in your hands, the certainty in which you are approaching your projects, your designs! (Lyn :)). And of course the laughter that is bubbling into the room each time we meet. The following are photos of projects at different stages – all to be celebrated! 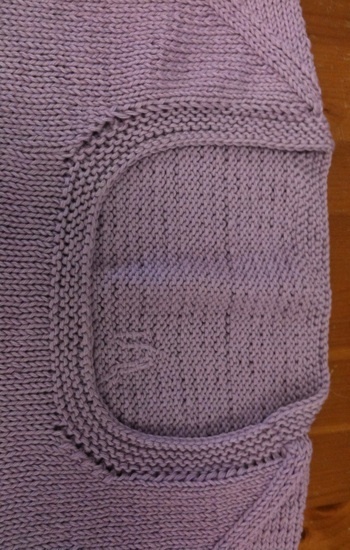 Lyn's Kitchener Stitch on her Bottom Up Sweater! 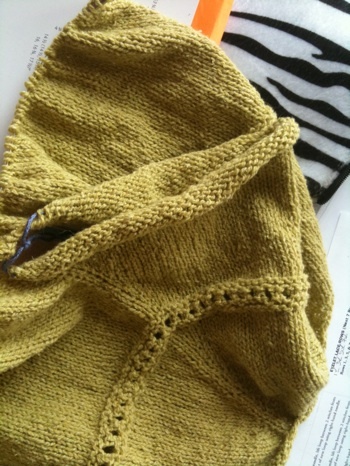 Lyn's Garter Stitch Neckline on her Bottom Up Sweater. Quite Wonderful! 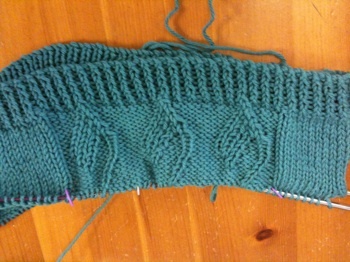 Raglan Decreases on Lyn's Bottom Up Sweater! Lyn's New Bottom Up Sweater Design! The Inspiration for Lyn's New Design. 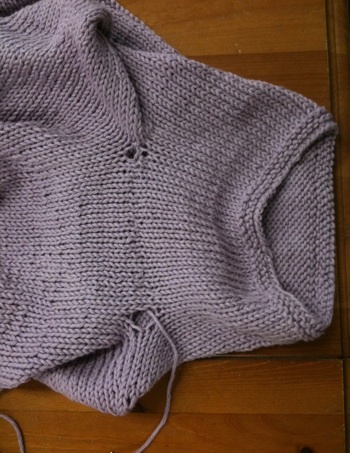 Now for the Top Down Sweater Projects in Progress! In this class we are learning the techniques and design structure of the Top Down Sweater using Barbara Walker’s Knitting From the Top book as the most fabulous reference guide any knitter could dream of and Wendy Bernard’s wonderfully insightful and instructive book, Custom knits, for patterns and technique as well. Again, I’m thrilled with what the students are learning and how much they are enjoying their work and individual processes! 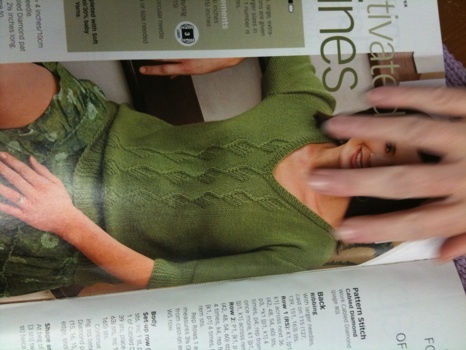 Students use ANY top down sweater design in this class – all techniques in the pattern are integrated into the class curriculum – this means even if your pattern doesn’t have you doing a “provisional cast on” or a “make 1 left increase”, your fellow classmate might be navigating this technique on their project and you’ll learn it too! 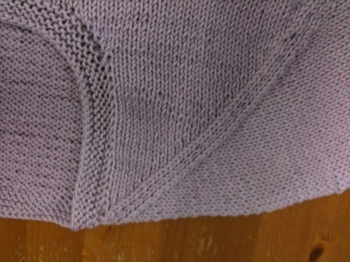 Here a a couple of photos of Cory’s Eyelet Cardigan by Chic knits in progress! 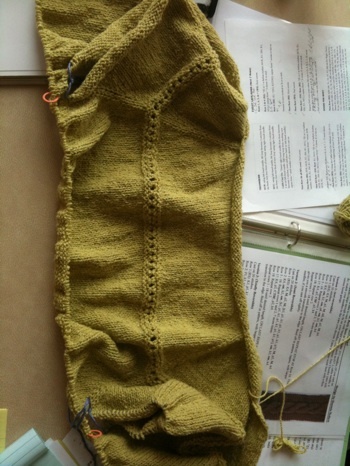 Cory's Top Down Sweater Showing Sleeves on Waste Yarn. Wonderful Eyelet Lace that defines the yoke! And Cory is a new knitter! I'm thrilled! All I can say is kathy is thrilled with learning – a true teacher and a kindred spirit. Here she has just done a long-tail provisional cast-on for the Slinky Ribs pattern in Wendy Bernard’s Custom Knits book. 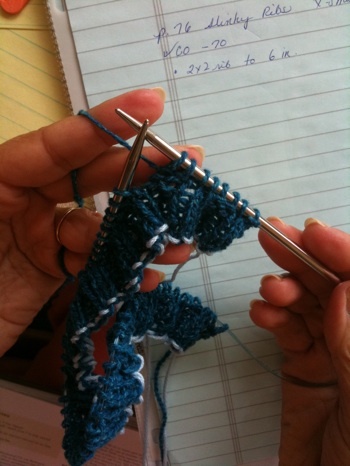 Detailed View of Kathy's Long-Tail provisional Cast-On.